Its Easter time, and my chance to give back to you – my readers, students and customers. To say thank you for your continued support, the encouraging emails and kind thoughts you send my way – YOU ARE MY INSPIRATION! 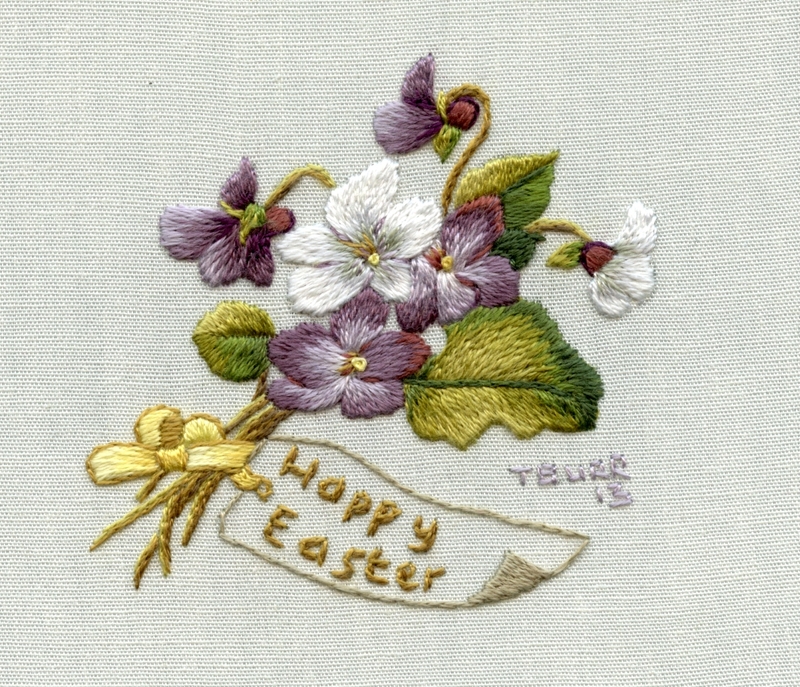 This little Easter Violets project was stitched especially for you as a gift from me, I wrapped it and am giving it! So wherever you are in the world thank you and Happy Easter. Many thanks Trish!!!!! As usual its so beautiful!!!!! Thank you for this lovely gift, and for all you do to share this delightful art. Thank you for the gift of violets! Have a Blessed Easter. Thank you Trish. The violets are lovely! Very thoughtful gift. Happy Easter to you and your family. Happy Easter to all. Thankyou Trish – that was unexpected and very much appreciated. I have really taken th thread painting – especially the birds. Wishing you a very Happy Easter and hope you feel the peace that only trust in our Lord can bring. Thank you so much for the Easter Violets. Was thinking what a lovely nametag it would make. My embroidery ladies at Craft are about to begin the Blue Wren – there is much excitement and anticipation. Thanks so much Trish its so sweet. Im doing the ontro course to minitures and so looking forward to it. Have a happy Easter. Sue. Wow, thanks very much, Trish! What a great chance to try a miniature. Happy Easter to you too! Thank you this sweet gift. What a lovely surprise, Trish. Thank you for your gift! Have a wonderful Easter. Thank you for this sweet gift and also for sharing your knowledge of this beautiful art. I’m so glad I recently found your blog. Janet in Atlanta, GA.